In this collection of prose poems, Schapira explores to explosion the very real spaces between the bounty tended and the bounty tendered, between the relationship nurtured and the relationship severed, between the dismembered parts of the incomplete body in a shattering array of brilliance. In these meditations on everyday life, Schapira proves the quotidian is really and truly bountiful. So too, is her writing: she is watching accident. She is seeing what she sees, imagining what others see. 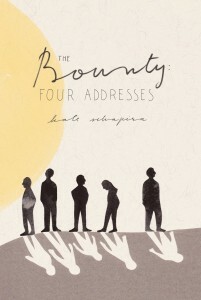 The Bounty: Four Addresses begins with the assumption that each human has a price on their head—the same price. Rushes and crystallizations of language probe our potential to do harm, or to lose our own minds, or respond to, refuse, erode or affirm the reality of another person. In four sections that move from chance encounters through love and fear to deliberate reflection, this book asks what states or what actions, our own or someone else’s, can make any one of us less real than any other. Kate Schapira is the author of How We Saved the City (Stockport Flats, 2012), The Bounty: Four Addresses (Noemi Press, 2011), Town (Factory School, 2010) and several chapbooks from Flying Guillotine Press, Portable Press at Yo-Yo Labs, Cy Gist Press, Rope- A-Dope Press and horse less press. Another full-length collection, The Soft Place, is forthcoming in 2012 from Horse Less Press. She lives in Providence, Rhode Island, where she co- curates the Publicly Complex Reading Series and writes, teaches, and works as a Writer in the Schools. Maureen Thorson reviews The Bounty along with Kate Schapira’s more recent collection, How We Saved the City, in a substantial piece for Open Letters. Tightly and masterfully written, its four sections harmonize perfectly into a brief but extremely powerful and nuanced exploration of the individual citizen’s – the individual person’s – interrelatedness and connection with every other person in the world.